Update 2015-03-25: Final update, 100% Votefair. Adanna edges out of really-sure territory. She’s fairly close with Daniel. Update 2015-03-23 @ 8 PM: Now with 80% Votefair. Adanna back in the red. Likeliest bottom 3 is her, Daniel, Maddie. Update 2015-03-20 @ 10 PM: Votefair is registering very few votes. I’m compensating with similar polls on a weighted basis. 60% Votefair, 20% tvline.com and 20% MJsBigBlog. The numbers will converge to Votefair’s if/when more people vote in that poll. Adanna rises a bit. She is still the most likely, but no longer outside the margin-of-error. Green = projected safe, Red = projected bottom 3, yellow = too close to call. Please read the methodology post for the details on how the model works. All the code and data are there. The judges used, some would say squandered, the save on Qaasim tonight. For now, the model is sour on Adanna Duru. She sang at the beginning of the show, she’s female, she had an ok-but-not-great performance, and her popularity is lagging. If her numbers improve, Daniel could be the call. Until that time, history would caution us that the VoteForTheWorst contestants have survived worse. Joey, Jax, and Clark are frontrunners in the view of the model, and I certainly wouldn’t disagree. These are the people to beat. Any of them would be a shocking elimination. Nick fell significantly this week in his WhatNotToSing rating, but I have trouble seeing him fall out of the safe zone. Qaasim himself is predicted safe even though he now has been in the bottom group. We’ll see if that holds up. The model continues to be doubtful about Rayvon. If his popularity among voters doesn’t rise, I’m not sure he can break out. As most likely to be eliminated this week, and now third most likely, things don’t bode well for him. Daniel’s positives are barely over 60%, which is pretty damn bad. Nobody else is below 70. But somebody is voting for this kid. 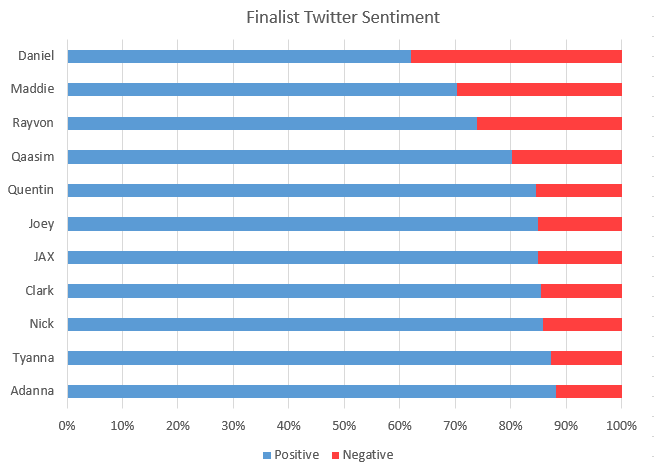 As for using the save, about 62% of tweets were positive about using it, versus 38% negative.